Episode 3.03 “Eat, Pray, Liv” — To help Clive (Malcolm Goodwin) solve the murder of a lifestyle guru, Liv (Rose McIver) consumes his brain and takes on his zen approach to life. Ravi’s (Rahul Kohli) old boss, Katty Kupps (guest star Christina Cox, “Arrow”), is getting closer to discovering the truth while also getting closer to Ravi. Meanwhile, Blaine (David Anders) and Peyton (Aly Michalka) continue their budding friendship, much to Ravi’s (Rahul Kohli) dismay. Lastly, Major (Robert Buckley) is struggling a bit at his new job. Mairzee Almas directed the episode written by Graham Norris. Air Date: Tuesday, April 11 on the CW Network. While Liv’s boss and sole confidante, Dr. Ravi Chakrabarti (Rahul Kohli), worked on a cure for her unthinkable condition, Liv battled the evil, zombie-making, brain-dealing Blaine (David Anders) and struggled to protect her loved ones and all of Seattle from a potential zombie apocalypse. Standing directly and unwittingly in the path of the oncoming zombie train is Liv’s ex-fiancée Major Lilywhite (Robert Buckley), whose life spiraled out of control when he uncovered the truth behind the rash of disappearances in Seattle – and what was really being served up at Blaine’s butcher shop. After months of experiments, Ravi comes up with what he thinks could be the cure for zombie-ism. Due to the lack of tainted Utopium, he’s only able to produce one vial of it. When Major faces death as he meets Blaine in a final confrontation, Liv uses half of the cure on Blaine to keep him at bay, and the other half on Major to save him from becoming the newest member of the undead. In season two, with Liv’s secret out, she faced new and even more powerful enemies, and old enemies in surprising new forms. And with the zombies of Seattle mysteriously disappearing, Liv and Blaine reluctantly found themselves on the same side. Unlikely alliances were struck, relationships challenged, and the line between good and evil blurred for both zombies and the fully living. Rob Thomas, Diane Ruggiero-Wright, Danielle Stokdyk and Dan Etheridge serve as executive producers. iZombie is produced by Bonanza Productions Inc. in association with Spondoolie Productions and Warner Bros. Television. 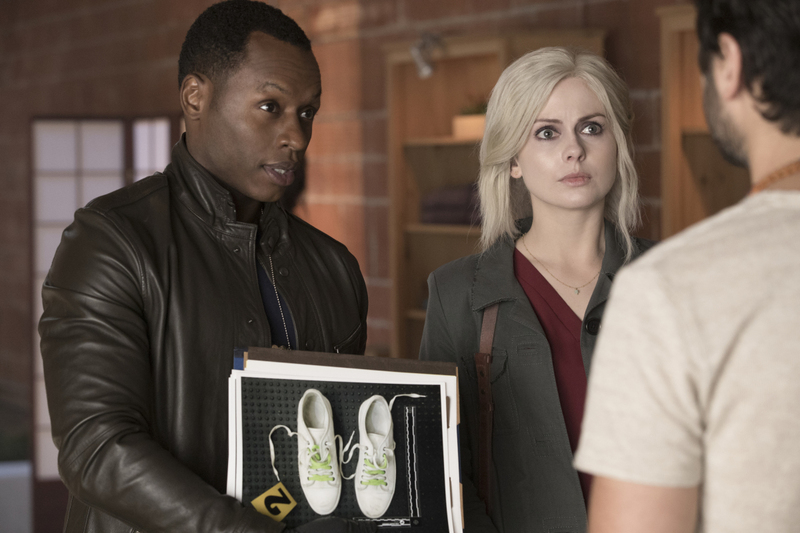 iZombie -- "Eat, Pray, Liv" -- Image Number: ZMB303b_0202.jpg -- Pictured (L-R): Malcolm Goodwin as Clive and Rose McIver as Liv -- Photo: Jack Rowand/The CW -- ÃÂ© 2017 The CW Network, LLC. All Rights Reserved.